Come up with a killer business idea? Check! Put all the groundwork in place? Check! Get the money to fund it? …This is where entrepreneurs tend to hit a roadblock. Thankfully, there are plenty of financial options available to start-ups who are looking to fund their growth. Here, we explore six of the most popular sources of business finance available and how you can go about getting them. Additionally, you’ll find business finance compared in the table below – click the links to learn more! Perhaps one of the most popular sources of finance for a business, a business loan is a sum of money borrowed from an organisation in order to fund your business’ growth. As with all loans you’ll be required to pay it back, along with interest – but you won’t have to give up any equity to the organisation. You’ll also need to undergo stringent credit checks and present a detailed business plan to the lender. Before deciding which loan to apply for, make sure you understand the difference between secured and unsecured loans, and consider – realistically – how much you’ll need to borrow and how long it’ll take to pay it back. Secured loans require you to have assets you can sell if you can’t keep up repayments, whereas unsecured loans don’t – but they do need you to have a promising track record. Government initiatives. Government-backed firms such as The Start Up Loans Company – which lends between £500 and £25,000 in an unsecured loan – aim to make it easier for entrepreneurs to get going. Peer-to-peer lending platforms. Defined as ‘alternative finance’, online peer-to-peer lending platforms like Funding Circle enable businesses to borrow money from investors quickly and on a flexible basis. One of the more competitive sources of funds for businesses, start-up business grants are effectively cash awards, given to new businesses or entrepreneurs looking to fund a start-up concept. Often, you won’t be required to pay interest on grants – or pay them back at all. Offered by the government, the European Commission, local authorities, universities and organisations such as charities (check out our guide to the grants available), grants are most often awarded to businesses who are improving lives, innovating a particular sector or contributing to the economy. How can I get a small business grant? Unsurprisingly, grants are highly sought-after and competition for them is fierce. As a result they’re notoriously difficult to obtain. Grants tend to have strict eligibility criteria, so narrow down your search by finding ones that you’ll be eligible for. Factors impacting this will include your business’ purpose, where it’s based, and its size and age. You can find more advice on how to beat the competition and secure a grant in our detailed guide to applying for a business grant. A speedy way to get cash into your business while you’re waiting on payments from customers or clients – and a good way to alleviate the headache caused by late-paying customers – invoice factoring and invoice financing are similar processes which operate in different ways. Invoice factoring involves selling unpaid invoices (also known as receivables) to a financial company. Usually within 48 hours, the company will pay you a bulk portion of the money owed on the invoice (known as a cash advance). The financial company itself will collect payment from the client, then pay you the remaining money (known as the reserve), minus the fees they charge for their services. You can find out more in our detailed guide to factoring and invoice factoring fees. Rather than selling your unpaid invoices, invoice financing enables you to borrow money against them. While waiting for an invoice to be paid, invoice financing enables you to borrow a bulk amount of the invoice’s value from a financial company, and receive it as a cash advance. Once your client pays you, you’ll be required to pay the money you were lent back. When deciding whether to factor or finance, you’ll need to consider various factors such as fees, flexibility and whether it’s important to you that your business takes customers’ payments directly. 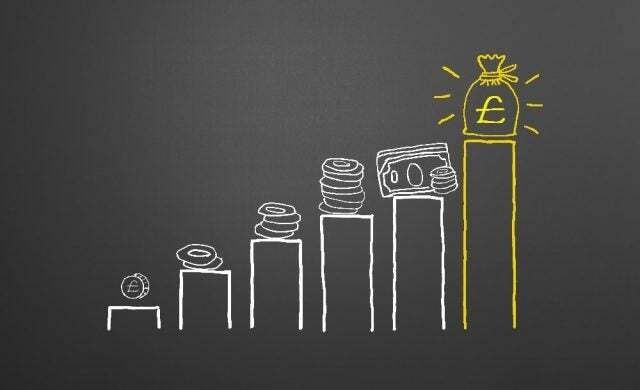 An increasingly popular source of business finance, crowdfunding entails posting a business pitch online and encouraging members of the public to pledge money to the start-up. On many crowdfunding sites, backers can invest as little as £10 in a business, so campaigns have the potential to attract thousands of backers. It’s a great way to drum up public interest and even secure brand ambassadors. In this, businesses offer rewards – such as a discounted pre-order, freebies or an invitation to a launch event – in return for a pledge. The larger the pledge, the better the reward. The obvious benefit here is that you don’t have to give away equity; but if you’re looking for experienced investors who’ll help you grow, this isn’t the route to go down. Many backers will simply be laymen who want your product. Well-known rewards-based crowdfunding platforms include Kickstarter and Indiegogo. Conversely, equity crowdfunding businesses offer investors an equal share of an equity stake. While you do have to give away a portion of your business, your investors will be more inclined to actively support you – after all, they’re looking for ROI. You may well encounter angel investors here. Seedrs and Crowdcube are popular platforms in equity crowdfunding. How do I go about crowdfunding? Choosing which platform to use: Different platforms present different rules, regulations and opportunities. Setting your funding target: Too high, and you may not reach it (some platforms won’t enable you to take home any of the money if this happens). Too low, and you may need to raise again, wasting time and resources. Marketing: Advertise the campaign well, putting the opportunity in front of the public and your target investors. For more tips and insight, check out our crowdfunding hub. Angel investors are high-net-worth individuals, often with extensive business experience, who can provide capital early in a business’ life – in exchange for a portion of equity (they will want a return on their investment!). Many will also act as mentors, using their experience and connections within a particular sector to propel the start-up’s growth. One of the more publicised sources of finance for businesses, if you’ve watched the BBC’s Dragons’ Den, you’ve seen angels in action. Attend events that angels will be going to. Take your business cards and prepare a short elevator pitch that explains your business’ concept. Reach out to angel investors on LinkedIn. Ask other business owners to introduce you to the angels they’re connected with. Research angel syndicates (networks of angels who invest together in the same businesses) – they tend to run pitching events which you can apply to join. Remember, research is crucial to finding the right angel investor. Many will stick to investing in the sectors they have most experience in, so look into their investment portfolios, websites and social profiles to find out whether your business is one they’d be interested in. For more advice, check out our feature on how to find angel investors for your start-up business. Of course, business funding is by no means easy to come by. If you’re finding it difficult to obtain – or you’re otherwise not tempted by any of the above sources of business finance – you might decide to bootstrap your start-up. A bootstrapped business is one which takes in no external funding: rather, the founder starts it up with their own personal finances, and reinvests the business’ revenues into growth and development. In facing roadblocks where spending money can’t be the answer, you’ll find that you’ll adopt a more innovative mindset, coming up with unique and sustainable solutions and methods. How can I bootstrap successfully? When bootstrapping, you’ll need to be as lean as possible – there’s no room to splurge on television ads or hire a team right off the bat. Instead, focus on what you can achieve with limited funds; such as running social media campaigns, using freelancers and renting (rather than buying) equipment and premises. It’s far easier to bootstrap a business that can, by its nature, be launched and ran with very little capital. Check out our list of 10 small business ideas that can be started on a shoestring, and our collection of start-up guides for businesses that’ll cost less that £10,000 to get going.